Going out to dinner as a family can be a meaningful family experience, but that may quickly change once you start glancing over the kid’s menu. The average kid’s menu generally consists of chicken fingers and fries, mac and cheese, hamburgers, and the occasional sub-par quesadilla – depending on the cuisine. Not only are these items high in fat and sodium, but they’re also unappetizing, lack flavor and tend to be overpriced! Some restaurants have the audacity to serve authentic Italian cuisine and charge $8 for buttered pasta in a bowl. The unpalatable options reserved for children are unhealthy and doesn’t allow one to take advantage of the chef’s wide array of expertise. For instance, how hard is it to make grilled cheese? The lackluster kid’s menu options aren’t exactly challenging or expanding children’s palates. A menu should serve as a great tool for school-age children to practice reading skills. However, what if the only options are harmful to their health? Imagine if adult standards were reduced to that of the children’s menu? You wouldn’t eat at that particular establishment, and you’d be insulted. You should be just as easily offended by what they offer to your kids. The real challenge is how to combat this problem. What about that menu that doesn’t come with crayons? Adult entrees are often filled with flavors, international spices, vegetables and almost always have a “lighter” option. Why not inquire with your server to see if it’s possible to order a smaller portion of the whole wheat chicken linguine, or ask them to hold the gravy on the mashed potatoes. Scour the entire menu for the best starters, shared plates, and side dishes, and piece them together to create your own plate. 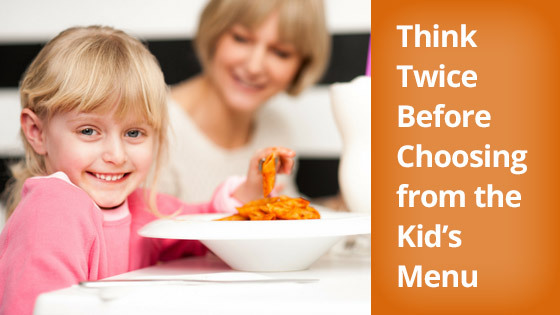 Another easy idea is to share a portion of your meal, with your children. This is a noticeable gesture that we all eat the same thing in our family, and just because you’re a kid doesn’t mean you eat any different or less-than adults. Perhaps if enough parents start complaining, and stop ordering the hot dogs – chefs will get the picture and start exposing their future customers to new and exciting plates.